Hello there and Happy SUPER Saturday to you! I am excited (and a bit nervous) to share a new creation for this week's Our Creative Corner challenge. This week, the lovely Tui Nathan is out hostess and boy, has she come up with a challenge for us. GAH! 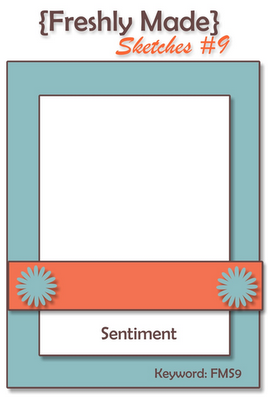 This week, we are focusing on masculine cards with NON-Masculine colors. "Masculine cards are the type of cards I have the most difficulty with, therefore my challenge is to create a masculine card or project. However, if you would like a real challenge and to step up the heat a bit try creating a masculine card .... using .... non-traditional masculine colours - plus, any neutrals of your choice." So, in an effort to jump-start my creative mojo, I turned to another challenge for the card design. Tui is on the DT for Freshly Made Sketches as well, and she designed the fun sketch this week. So this is technically a "two-fer" challenge...well, actually, it is a "Tui-fer"! 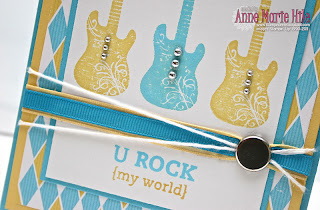 I created this card for my favorite "rock-star" (aka: my sweet hubby!). He is headed to "H-Town" this week for a concert, with a good friend. For all of you non-Texans...that is Houston. They are going to be livin'-large, "VIP-style"...hanging with the band and all that cool-stuff. I wanted to make a card to tuck in his bag for the trip. I used a little argyle from the Big Top Birthday DSP, along with a color combo of Daffodil Delight and Taken with Teal. Yup, I realized after typing those names that they SO do not sound really masculine. But, pairing them up with the Grunge Rock stamp set has to count for some extra "guy" points, right? Hope you have a chance to play along at Our Creative Corner this week! Please stop by to see what the rest of the Design Team have whipped up this week for this "guy" challenge. We hope you will have some fun and play along! lol Tui-fer...very funny! Love the colors and images you chose for this...great for both challenges! Thanks for playing along with Freshly Made Sketches this week! Fun and cute card! Love those wonderful colors and this will be great for any guy. Wonderful card! That is a tough challenge, but you really did it up great. Love the colours you used and those guitars are perfect! I love it - Tui-fer! You crack me up, Anne Marie! I think you rocked the challenge (pun unintended) to make a masculine card using non-manly colors. Hope your husband has a rocking time with the band! Love the bling on the guitars as well - thanks for playing along this week at Freshly Made Sketches! I love this card, it's awesome! I especially love what you did with the ribbon/baker's twine! Fabulous card, Anne Marie! Those colors are great and the guitars are awesome with their bling. You rocked this challenge! Love the fact that you created a Tui-fer! The colors are great and those guitars rock! Amazing what that bit of bling adds to them! Great card! Thanks for being a great sport and taking up the heated version of this challenge ... cos I tell ya, you rocked it, this definitely spells masculine to me .... I love these bright rockin colours, the print and the guitars are awesome!!! How sweet of you to tuck a little love card into your hubby's case ...love it!!! I think you ROCKED this challenge, Anne Marie! Seriously, your card is fantastic. I love the color combo you came up with - that DP is fabulous and the guitars are terrific. Super job on this week's challenge. Wow! Great job with the man-card! I saw that challenge and gave up before I even started! My husband would LOVE this card. I may have to CASE it! Thanks for playing with Freshly Made Sketches this week! 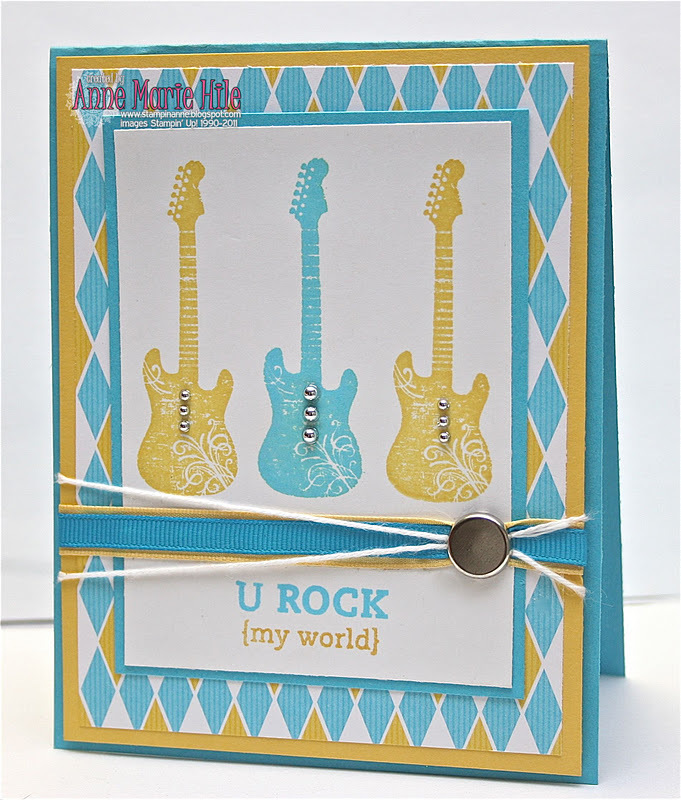 You "Rocked" this "Tui" fer card. Love the ribbon treatment and the three stamped guitars. Awesome job AM. Does it get better that a stamping Tui-fer??!! This is awesome! Love the colors and you, um, "rocked" the layout. Glad to see you this week at Freshly Made Sketches! Super card Anne Marie, love the colors you used and the stamps are perfect for this challenge!!! Anne Marie, you are such a clever gal! I would never have thought about going to Tui's sketch challenge site. (And yes, it does qualify as a Tui-fer). I agree that the colors you chose are not traditional masculine colors, but the guitars are PERFECT! Great card! and love the creative inspiration! Oh my, what a challenge!! This is awesome!! You 'rocked' this challenge! Well, Anne Marie, your Tui-fer card is sure to be a huge hit! The colors are so awesome and perfect for your masculine card. I LOVE how you did the ribbon and twine with the big brad! Thanks for joining us at Freshly Made Sketches!